President Donald Trump has tapped Mick Mulvaney, director of the Office of Management and Budget as acting White House chief of staff. "I am pleased to announce that Mick Mulvaney, Director of the Office of Management & Budget, will be named Acting White House Chief of Staff, replacing General John Kelly, who has served our Country with distinction. Mick has done an outstanding job while in the Administration," Trump tweeted. "I look forward to working with him in this new capacity as we continue to MAKE AMERICA GREAT AGAIN! John will be staying until the end of the year. He is a GREAT PATRIOT and I want to personally thank him for his service!" Mulvaney, one of the original founders of the hard line conservative House Freedom Caucus and a backer of Trump during his candidacy for the presidency, was named as the director of the Office of Management and Budget in December of 2016. In a tweet on Friday night, Mulvaney expressed his gratitude to the president. "This is a tremendous honor," Mulvaney said. "I look forward to working with the President and the entire team. It's going to be a great 2019!" Some Democrats were not as enthused about Mulvaney, who, as a conservative House member in 2013 pushed House GOP leaders to shut down the government over Obamacare. A spokesman for incoming House majority leader Nancy Pelosi said that the choice of Mulvaney "sends a clear message that at this critical time the President would choose to elevate the architect of the last Republican government shutdown." Through his tenure, Mulvaney fortified a close alliance with the president as he proposed steep cuts to the federal budget and gained notoriety for his sparring sessions with reporters in the White House briefing room making the case for his fiscal hawk approach to gutting the country's entitlement programs. 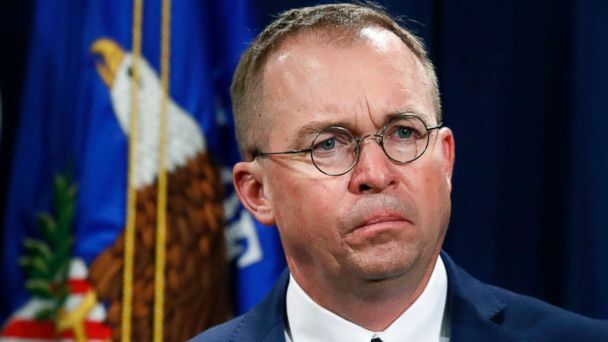 In November of last year, President Trump appointed Mulvaney to the head of the Consumer Financial Protection Bureau, a government oversight agency born out of the 2008 financial crisis that Mulvaney had once advocated for eliminating entirely. As Mulvaney sought to reign in many of the CFPB's previously announced enforcement activities against financial institutions which he described as government overreach, Democrats cast him as a symbol of the Trump administration's efforts working to benefit big business over American consumers. But those attacks if anything have further endeared the president to Mulvaney. Last year, Mulvaney was tasked with announcing the president's 120-page plan to reform and reorganize the entire federal government. Mulvaney's six years serving as a congressman from South Carolina could provide him a skill set that will mark a significant departure from his predecessor. While John Kelly's arrival was initially framed as a turning point in restoring order and discipline to a chaotic West Wing, Republican lawmakers will likely see an opportunity in Mulvaney's ascension to achieve closer coordination and direct access to the president in a way that benefits their legislative agenda. John Kelly will remain chief of staff until the end of the year. Until then, Mulvaney will work with Kelly. Mulvaney will be replaced as OMB director by Russell Vought, who is currently the agency's deputy director. Vought is a former vice president of the conservative Heritage Foundation, served as executive director of the Republican Study Committee -- the largest GOP caucus on Hill -- and served with Mike Pence at the House GOP Conference when Pence chaired the conference. His wife Mary is a former Pence communications director at the GOP conference as well. It took almost a year for successful Senate confirmation of Vought's nomination, and Pence was there in the Senate chamber to break a 50-50 tie on Feb. 28. ABC News' Jonathan Karl, Devin Dwyer, Katherine Faulders, Meghan Hughes and John Parkinson contributed to this report.